Lipids are major ingredients in cosmetics and play an essential role in cosmetics ability to improve skin, hair, nail and mucous membranes aspect, sensory qualities and condition, either by interacting with skin components, enhancing active ingredient release or by spreading and forming a protective layer on its surface. Eurofins Cosmetics was present at Cosmetorium in Barcelona on September 26th, at Techfocus section of the Fair, performing a lecture about a wide range of methods to evaluate classical and trendy claims regarding the lipids in cosmetics, always tailoring the protocols of the studies at the customer’s convenience. You can find some examples below. Eurofins Cosmetics, a knowledgeable and reliable testing partner for hair products development. Eurofins Cosmetics offers the latest biophysical hair care product testing facilities to determine the efficacy of hair products as well as for carrying out claim substantiation: hair combing, volume effect and curl retention. For more information, please contact cosmetics@eurofins.com. On 8th October 2018, the European Commission notified World Trade Organization (WTO) about a new Draft Commission Regulation amending Annex VI to Regulation (EC) No 1223/2009 of the European Parliament and of the Council on cosmetic products. The aim of this new Draft Regulation is to amend Cosmetics Regulation by adding Phenylene Bis-Diphenyltriazine under Annex VI – list of authorized UV filters at a concentration up to 5% in cosmetic products. Click here to access the notified draft document G/TBT/N/EU/608. The European trade association for the cosmetics and personal care industry, Cosmetics Europe, issued a press release regarding the decrease in the use of plastic microbeads for wash-off cosmetics and personal care products between 2012 and 2017. This decrease is possible thanks to industry’s voluntary initiatives and actions and the increased concern for protection of the aquatic environment. Click here for getting the article at Cosmetics Europe website. Following on from progress made at the latest round of ISO meetings, the 25 gathering of the Working Group, held in Warsaw (Poland) in late May this year, four sunscreen related documents should appear in their final form for public comment and then voting during 2019. This is the in vivo SPF standard and will have completed its review begun 5 years after publication. The main changes will be the inclusion of much more detail of the procedures for test volunteer selection, the method of application relative to types of sun protection products and a very specific description of the end point of the test - that is the reading of the erythema following Solar Simulator exposure. There will be minor changes to this test method and there does not appear to be any controversial issues within the current test method. This is a new standard for a water resistant test method. It is mostly compatible with the current AS/ZNS 2604 but involves more detailed specification of the environmental and water quality conditions of the immersion device. As well, there is a requirement to validate a reference sunscreen for water resistance. Not likely to be adopted in Australia, but for replacement of current “COLIPA” , this method describes the method of arriving at the wash off and limit of percentage of retention when testing to the ISO 16217 methodology. All of the above are up for discussion at the next ISO Technical Committee 217 Working Group 7 meeting scheduled for Monaco, November 19th and 20th. Eurofins | Dermatest (Australia) and Eurofins | EVIC (Spain) will be attending this Working Group meeting. In August 2018, Minnesota Department of Health released an educational handout about formaldehyde in children’s personal care products. This document explains the possible health hazards that high levels of this substance may cause. Click here for getting the educational handout. The aim of this revision is to improve the registration management of cosmetics. International Cosmetics Standard Chinese Name Directory (2018 version). The 2018 version has 22620 ingredients: 6971 new ingredients compared with old version. On 10th October 2018, the State Council of China issued a notice advancing the Reform of “Separating Certificates from Licenses” nationwide, involving 106 enterprise-related administrative approval items. Among these items, first-imported non-special use cosmetics will be changed from administrative approval to filing management nationwide, and the approval period of cosmetics production licenses will be reduced to two-thirds of its original. Click here for getting the announcement (in Chinese). The following 9 alerts regarding cosmetic products have been reported, from week 38 until week 42. Bath product: Due to its characteristic appearance, colour and size, this product may be mistaken for a foodstuff. This product has pieces that can easily detach. A child may put these pieces in the mouth and choke. The product does not comply with the Cosmetics Regulation or with the requirements of the Food imitating Products Directive. From on 21st September to 20th October, CPSC (Consumer Product Safety Commission) has published the following recalls: 1 recall regarding cosmetic products. 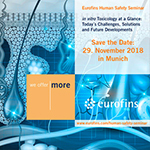 On 29th November 2018, Eurofins Human Safety Testing is offering a toxicology seminar in Munich, Germany. The seminar aims to provide an overview of the test methods currently available, describe challenges encountered in their application and outline possible solutions. New methods under development or validation programs will be presented and discussed. Beside experts from Eurofins and BSL BIOSERVICE two external speakers from SenzaGen and Episkin will held a lecture about alternative in vitro methods.